Members of the Knickerbocker Base Ball Club get together for this picture taken in 1862. A handful of baseball’s most astute fans gathered Saturday, May 14, at Green-Wood Cemetery in Brooklyn. They were there to honor the life of James Whyte Davis. “Too Late” Davis, as many called him because he often showed up tardy to his own games, played for the historic Knickerbocker Base Ball Club, based in New York City, one of the sport’s early teams. Davis also served as Knickerbockers president for a time. Born on March 2, 1826, Davis died in Feb. 15, 1899, put to rest in an unmarked grave. Now, thanks to the Society for American Baseball Research (SABR), that sad circumstance has changed. SABR, a Phoenix-based group dedicated to all things baseball, placed a headstone at Davis’ burial spot. SABR hopes to provide many more former players with headstones (or replace crumbling ones) through its 19th Century Grave Marker Project. Davis’s was the first. Other candidates include Hall of Famers James “Pud” Galvin, a 365-game winner, and King Kelly, who compiled a .308 lifetime batting average and led the league in hitting twice. A page on SABR’s web site explains the Grave Marker project. Anyone interested can make a tax-deductible donation to support this mission. MLB has kicked in a $10,000 donation to help get things going. SABR also needs members to do some field research and verify if a former player is buried in an unmarked grave or one that is in serious disrepair. (Click here for SABR membership information.) Former managers, umpires, baseball writers and others connected to the game also may be included in this project. The stories of so many early baseball people have been lost to time. “Too Late” Davis’s story is worth knowing. He began playing for the Knickerbockers in September 1850 and kept going for 25 years. Davis roamed centerfield in the Fashion Race Course Games of 1858, a three-game series played in Queens, N.Y., between New York and Brooklyn and basically baseball’s first All-Star games. Davis competed for New York. From 1858 to 1860, he was president of the Knickerbocker club. In 1867, Davis served as a delegate to the 1867 national convention of the National Association of Amateur BaseBall Players, the game’s governing body. Davis also gets credit for designing the Knickerbockers’ first banner, unveiled Aug. 27, 1855, at the Elysian Fields in Hoboken, N.J. In the shape of a triangle, the banner featured a blue “K” set against a white circle with a red-and-blue background. Until 1875, this flag flew over the team’s clubhouse. Besides being a ballplayer, Davis also worked as a firefighter and stockbroker. He never made much money, however. Late in life, knowing the end was near, Davis wrote a letter to New York Giants owner Edward B. Talcott. The letter also includes the former ballplayer’s proposed epithet: “Wrapped in the Original Flag …” Unfortunately, times were tough, and the dimes didn’t trickle in. Davis was, however, buried in his baseball uniform, wrapped in the team pennnat. Denton True Young threw so hard that people nicknamed him “Cy,” short for Cyclone. Born on the farm in Gilmore, Ohio, on March 29, 1867, Cy Young made his major league debut Aug. 6, 1890, for the Cleveland Spiders. He tossed a three-hit shutout. In an age of strong-willed ironmen, no one was tougher than Young. He won more games than anyone in baseball history (511), and he lost more games than anyone (316) over his 22 seasons. Young is nearly 100 wins ahead of the No. 2 guy on the all-time wins list, Walter Johnson (417 wins). The 6-foot-2-inch right-hander completed nearly 92 percent of his career starts. Poet Ogden Nash wrote this little ditty about Young for the January 1949 edition of Sport magazine. Young began his career with the Spiders (1890-98). He went from there to the St. Louis Perfectos/Cardinals (1899-90), the Boston Americans/Red Sox (1901-08), the Cleveland Naps/Indians (1909-11) and, finally, the Boston Rustlers/Braves (1911). Young won at least 25 games in a season 12 times and at least 30 games five times. He won 93 games from 1901-03. He started more games than anyone in baseball history (815) and completed more than anyone (749). No one pitched more career innings than Young (7,356) or gave up as many hits (7,092). He topped the 400-inning mark five times and yielded 477 hits in 1896. Young only made it through the sixth grade in school. That didn’t stop him from serving as pitching coach at Harvard University for a few months before the start of the 1902 campaign. Baseball played the first modern World Series in 1903. The Boston Americans, winners of the American League pennant, went up against the National League champ Pittsburgh Pirates. Young, pitching in Game One for Boston, lost 7-3. He came back and won his next two games, posting a combined Series ERA of 1.85. The Americans won the best-of-nine match-up five games to three. On May 5, 1904, Young tossed the first perfect game of the modern era (post-1900). Pitching for the Americans, he beat the Philadelphia A’s at Boston’s Huntington Avenue Grounds in front of 10, 267. Young, who threw three no-hitters in his career, struck out eight batters in a game that lasted one hour, 25 minutes. He beat the great Rube Waddell. Young aged gracefully. He tossed his final no-hitter in 1908, three months after he turned 41. He was the oldest to throw a no-no until Nolan Ryan hurled one 82 years later at the age of 43. The pitcher is tied with Roger Clemens for first on the all-time Red Sox wins list with 192. Clemens pitched 2,776 innings for Boston, and Young pitched 2,728.1 innings. Cy spent eight seasons spent the Red Sox; Clemens spent 13. A control artist, Young topped his circuit in BB/9 innings 14 times and in K/BB ratio 11 times. He led the league in strikeouts twice. This all-time great retired with a career WAR (Wins above Replacement, according to baseball-reference.com) of 168.4. He exceeded 10.0 in seven seasons and posted a career high of 14.1 in 1892 for Cleveland. He ranks second on the all-time list, just behind Babe Ruth (183.6). In 1999, baseball named Young was named to its All-Century Team, a dream squad made up of great players from throughout the game’s history. Other pitchers on the team included Roger Clemens, Bob Gibson, Lefty Grove, Walter Johnson, Sandy Koufax, Christy Mathewson, Nolan Ryan, Warren Spahn and Cy Young. Hal Chase played first base as well as anyone. By most accounts, he was also a scoundrel. Chase died poor on May 18, 1947, at the age of 64. He left a mess of a life behind. The former ballplayer threw games like most guys threw fastballs. It didn’t matter the team or the league. Hal Chase was a dirty player. George Stallings, Chase’s manager with the New York Highlanders (forerunner of the Yankees), accused Chase of “laying down” in games, according to a New York Times article written by Jim Reisler in 2013. Frank Chance, another Highlanders skipper, made the same claim. He also was a borderline Hall of Famer. Harold Homer Chase, born Feb. 13, 1883, in Los Gatos, Calif., near San Francisco, grew up around a local lumber business that his family had built. The only piece of lumber that interested Chase, though, was a baseball bat. He played semi-pro ball in the Bay Area and at Santa Clara College (now Santa Clara University), a West Coast powerhouse. The Los Angeles Angles of the Pacific Coast League signed Chase to a pro contract in 1903. The rookie quickly turned into the star of the team. (He also reportedly bribed players and umpires.) A reporter for the Los Angles Examiner wrote, “If Chase isn’t a great natural ballplayer, then Los Angeles never saw one,” according to an article on Chase in baseball-almanac-com. Soon, the Highlanders swept in and inked Chase to a deal. New York City suited Chase. He liked the restaurants, the nightclubs, the fancy restaurants. He knew song-and-dance man Al Jolson and composer and theatrical producer George M. Cohan, according to an article written for the Society for American Baseball Research. Did Chase get to know some shady characters, too? That seems like a good bet. 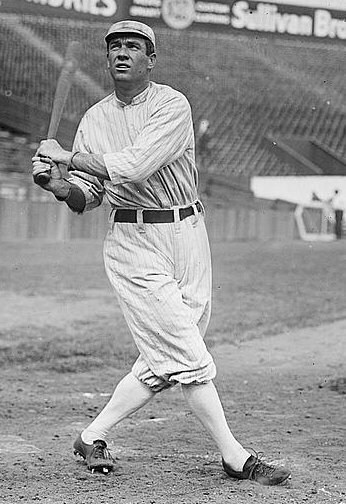 Chase spent 15 seasons in the majors (1905-19). He batted .291 lifetime (but with just a .319 on-base percentage. Hal worked the odds, not the count.) The right-handed batter (lefty thrower. Chase was quirky in more than one way.) ripped 57 career homers, playing his entire career in the Deadball era. He led the Federal League in homers with 17 in 1915 as a member of the Buffalo Blues. Good glove and all, trouble followed Hal Chase. Or, more appropriately, Hal Chase followed trouble. Managers marveled at Chase’s range and the way he caught nearly every pop-up hit in his direction. They also accused him of being a “selfish prima donna” and a “disruptive force,” according to the SABR article. He threatened to jump leagues from the majors to the outlaw California State League. He demanded that managers be fired. Reisler’s article features a quote from Frank Lieb, one of the most respected writers in baseball history. Lieb believed the rumors that Chase cozied up in the back pocket of gamblers. “His neatest trick, I think, was to arrive at first base for a throw from another infielder just a split second too late,” Lieb once wrote. Chase made fun of managers, ignored instructions, sawed players’ bats in half and the like. Oh, and he cheated at poker, too. The Yankees (They began using that name in 1913. ), which went into the season with high expectations, traded Chase to the Chicago White Sox on June 1. Chase was batting all of .212 at the time. The deal didn’t help. The Yanks still lost 94 games. But, Chase was someone else’s problem. “Prince” Hal (an ironic nickname?) jumped to Buffalo and the Federal League during the 1914 season. He played for the Cincinnati Reds from 1916-18 and retired after his 1919 campaign with the New York Giants. Rumors about Chase continued. Some say he acted as a middleman of sorts between the players and gamblers involved in the infamous Black Sox scandal of ‘19. Nothing was proved. MLB Commissioner Kennesaw Mountain Landis threw Chase out of baseball anyway. Even so, Lawrence Ritter and Donald Honig included Chase in their 1981 book, The 100 Greatest Baseball Players of All Time. Chase also picked up 11 votes, or 4.9 percent of the total, on the initial Hall of Fame ballot in 1936, more than eventual inductees John McGraw, Mordecai “Three-Finger” Brown and others. Chase’s on-field talent is no longer so strong. Bill James, despite the previously mentioned quote, only rated Chase a C-grade first baseman defensively in his book Win Shares. Chase made lots of errors, purposely or not. Post major leagues, Chase drifted from teams in California to ones in Arizona and Texas. By time he died, he had gone through a few marriages and had an estranged son. Near the end, he admitted mistakes and expressed remorse to reporters for at least some of his dirty deeds. Look back at the 1905 MLB season. Cincinnati’s Cy Seymour leads the National League with a .377 batting average and 121 RBI. The lefty batter from Albany, N.Y., also tops the NL in hits (219), doubles (40), triples (21) and slugging percentage (.559) in by far his best season in baseball. Seymour’s teammate, Fred Odwell, rips nine homers to lead the league. The outfielder did not make his MLB debut until 1904, when he was 31. He retires after the 1907 season with 10 career home runs. Elmer Flick, the American League leader in batting average, hits .308 for Cleveland. He also paces the league in triples (18), something he does three times in his 13-year career. Flick wins just one batting title in his career; he actually finishes with a higher lifetime average (.313) than he does in the year he tops the league. Christy Mathewson enjoys another big year for the New York Giants. He goes 31-9 with a 1.28 ERA. The right-hander also throws eight shutouts and strikes out 206 batters. Harry Davis of the Philadelphia A’s leads the league in home runs (8) for the second straight year. He goes on to top the league in 1906 and ’07 and retires with 75 round-trippers. The first baseman hits for the cycle on July 10, 1901. Rube Waddell, Philly’s enigmatic flamethrower, tops the league with 287 strikeouts. He also leads in wins (27, a career high) and ERA (1.48). Waddell retires with five 20-win seasons in his Hall of Fame career. Mathewson, Weldon Henry of the A’s, Frank Smith of the White Sox, and Bill Dineen of the Boston Americans all throw no-hitters. Jack McCarthy ties an MLB record by starting three double plays in one game for the Cubs. Archibald “Moonlight” Graham makes his MLB debut on June 29 for the Giants. Graham plays right field in the bottom of the eighth but never comes to bat in his only big-league game. His story is told in the book Shoeless Joe and the movie Field of Dreams. The Giants beat the A’s in five games in the World Series. Mathewson goes 3-0 in three starts with a 0.00 ERA in 27 innings. He gives up 13 hits, strikes out 18 and walks just one. Which Boston Red Sox …? They are the team of The Nation and The Monster. They play in historic Fenway Park, in the same place Cy Young and Babe Ruth played and Ted Williams played and David Ortiz, “Big Papi”, plays today. They were the Boston American first, from 1901-1907, and the Red Sox ever since. They have won 13 pennants and eight World Series titles, most recently in 2013. Good luck with the quiz. Which Boston Americans/Red Sox pitcher led the American League in wins from 1901-1903, going a combined 93-30? Which Boston Americans outfielder was the first player to hit two home runs in a modern World Series game? Which outfielder broke in with the Boston Americans and was nicknamed “The Grey Eagle”? He batted .345 over his long career, with 3,515 hits. Which Red Sox pitcher went an amazing 34-5 in 1912 with a 1.91 ERA and 258 strikeouts? Which Red Sox pitcher walked one batter on June 23, 1917? Which Red Sox pitcher retired 26 straight batters on June 23, 1917? Which Red Sox slugger belted 50 home runs in 1938, a team record that would stand for 68 years? Which Red Sox great hit just .254 in 1959, 63 points below his previous season-ending low? Which Red Sox outfielder played on four national championship teams at USC and led Boston to the 1975 World Series? Which Red Sox Hall of Famer is that team’s oldest living player, the oldest living Hall of Famer and the last man alive to play in the major leagues during the 1930s? Cy Young broke in with the Cleveland Spiders in 1900. He spent nine seasons by Lake Erie, went to St. Louis for two years and pitched eight years in Boston before going back to Cleveland. He won 511 games in his 22-year career. Patsy Dougherty only hit 17 regular-season home runs in a 10-year career. He did, however, belt two in Game 2 of the 1903 World Series. The Americans beat the Pittsburgh Alleganies 5 games to 3 in a best-of-nine affair. Tristram “Tris” Speaker, from Hubbard, Texas, spent nine seasons in Boston (1907-15) before going to Cleveland. He remains fifth on the all-time hits list and six on the all-time batting average list. Smoky” Joe Wood came up with Boston as a hard-throwing right-hander. He was never better than he was in 1912. Wood went 117-57 as a pitcher in his career, but switched to the outfield in 1918 after suffering an injury . “Smoky” Joe later served as head baseball coach at Yale University for several years. Babe Ruth, the greatest slugger of all-time, came up to big leagues as a hard-throwing left-hander. On June 23, 1917, in a road game against the Washington Senators, Ruth walked lead-off batter Ray Morgan on four pitches. The Babe proceeded to throw a punch at the umpire and was ejected. Ernie Shore entered the game in relief of Ruth. The runner on base was caught trying to steal, and Shore mowed down the rest of the Washington hitters in order. Shore compiled a 65-43 won-loss mark over seven seasons as a journeyman pitcher. Jimmie Foxx—“Double X”—slammed 534 home runs in his career, 222 of them during his seven years in Boston. He hit 50 in 1938, although he did not lead the league. (He was second. Hank Greenberg hit 58 for the Detroit Tigers.) He did finish first in RBI (175), batting average (.349), slugging percentage (.704) and several other categories. David Ortiz passed Foxx on the team’s single-season home run list in 2006 with 54. Ted Williams batted .344 lifetime. He won six batting titles in his career, including ones in 1957 and 1958 before slumping to .254 at the age of 40. Teddy Ballgame rebounded and hit .316 in 1960 before retiring. Fred Lynn played on the 1972 USC football team that won the national championship and the 1971-73 Trojan baseball teams that won titles. The Red Sox drafted Lynn in the second round of the 1973 draft. He hit .419 in 43 at-bats during a late-season call-up in 1974 and won the MVP in ’75. Lynn made nine All-Star teams, six with the Red Sox. He hit a memorable grand slam as an Angel in the 1983 game. Bobby Doerr, born April 7, 1918, in Los Angeles, is 97 years old and counting. A second baseman and life-long Red Sox player (1937-44, 46-51), batted .288 with 223 home runs. He was inducted into the Hall of Fame in 1986.